As soon as fall has officially arrived I’m way too excited to begin baking all things pumpkin. There is no better smell than pumpkin spice – ginger, nutmeg, cinnamon – all baked into a warm comforting pumpkin baked good. Pumpkin can be made both sweet and savoury and is so versatile when working with it. Fall is one of my most favourite seasons – the colours, cool days, candles, and holidays (Thanksgiving, Halloween) make it even better. I had to seriously stop myself from buying any sort of halloween or Fall paraphernalia from the Home Sense store in August. Now that it’s officially Fall, I feel I can let myself Fall fully with no inhibitions. Sorry, Adam. But really, they start bringing out those halloween and thanksgiving decorations in the summer, and by the time the holidays actually roll around all the decor has been packed up and its suddenly Christmas in October. Thankfully pumpkin is the ingredient of both halloween, thanksgiving and christmas so we can happily eat it for months. I don’t think I ever get sick of eating pumpkin, I even love adding it to my chili. 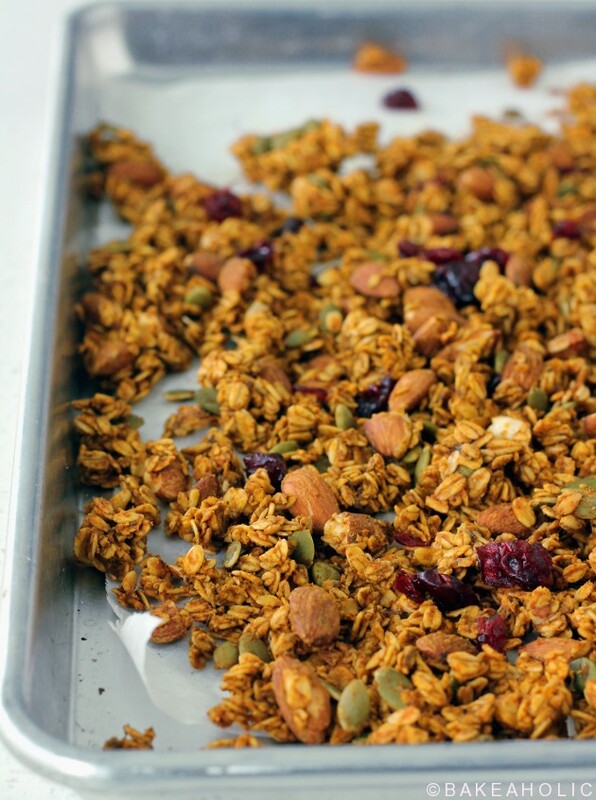 I had actually seen this pumpkin granola recipe in April, when another local Vancouver blogger, Jennifer from Foodess, had posted it – pumpkin goods know no boundaries. I was all for pumpkin in April. I knew I needed to make it come Fall, and It turned out better than my tastebuds imagined. I changed a few things, subbing in brown rice syrup for maple (feel free to use either), adding in pumpkin seeds and cooking it for a little longer, leaving it in the oven, to really crisp up the clusters. I found it was just as crunchy as store-bought, only obviously much better. The spice is perfect, and not overly sweet. I loved her idea of storing it in the freezer, it makes for a nice cold bowl of granola and milk, plus it prolongs its shelf life (that is, if you don’t eat it all in a week) – And as she says, most pumpkin granola is actually just ‘pumpkin spice’ with no trace of real pumpkin puree, whereas this recipe uses a whole cup. Feel free to make a half batch. 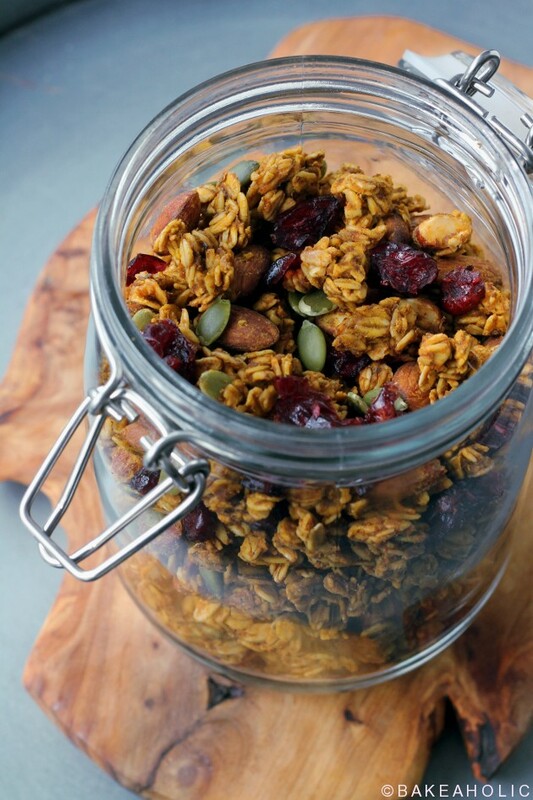 Crunchy, spiced pumpkin granola clusters with dried cranberry for added sweetness. In a mixing bowl, whisk together the pumpkin, cinnamon, ginger, oil, sugar, brown rice syrup and vanilla extract. Stir in the oats, almonds, pumpkin seeds and flaxseeds. Divide mixture between two large baking sheets lined with parchment and bake 45-60 minutes, stirring occasionally and checking frequently, until the almonds are golden and toasty and the granola is dry. Turn off oven and leave baking sheets inside, propping door open slightly. 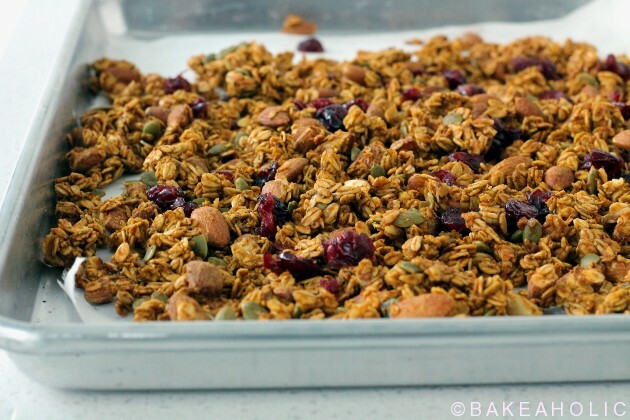 Allow the oven to cool down with granola inside to create dry, crunchy granola. Remove from oven, sprinkle cranberries overtop and mix in. Store in airtight containers for up to a week - or freeze in large freezer bag. 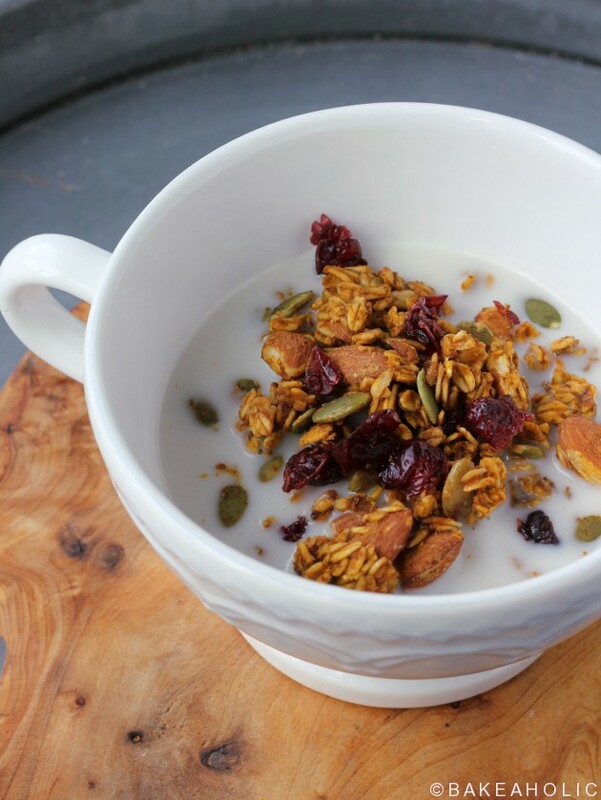 Crunchy granola keeps well in the freezer, remove and eat with cool milk or yogurt.